If Usain Bolt (9.58 seconds) or Andre De Grasse (9.91 seconds) ran the 100m at the 1936 Olympics in Berlin, Germany, how would they’ve fared against the legendary Jesse Owens (10.3 seconds)? Too bad we’ll never know. The time traveling dash took place shortly prior to this year’s Olympics. The natural inclination for sports commentators and analysts is to hype current athletes and achievements with superlatives. At times, the compliments fly at a slightly exaggerated rate. How quickly we forget the results of the past…or even just the last year. Still, there are athletic performances (individual and team) that warrant lightning-in-a-bottle fanfare. But it’s important to introduce perspective whenever possible. The fact is that Usain Bolt is a sprinter we may never see again in our lifetime. 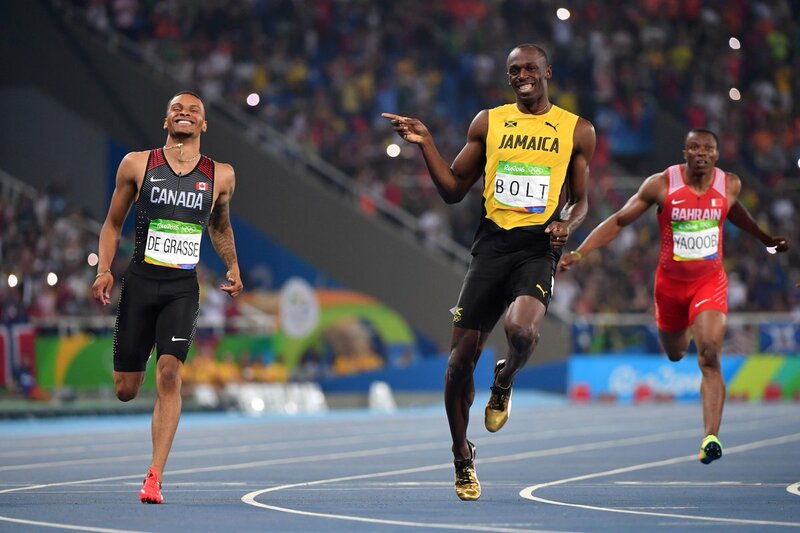 If you were to design the perfect sprinter, that final concept would look a hell of a lot like the 6’5″ Jamaican. Witnessing Usain Bolt sprint today is the closest feat of running dominance and wow factor fans can experience that compares to the “Buckeye Bullet” people saw take flight 80 years ago. Mr. Bolt’s achievements are undeniably laudable. However, as the phrase, “The greatest of all-time” is being cemented with his legacy, the video above shouldn’t necessarily deny that illustrious label. Instead, the struggle and significantly slower time produced by the 2016 Olympic 100m bronze medalist Andre De Grasse (9.91 seconds) should provide historical perspective and weight to the conditions, resources and technological advances made between 1936 Germany and 2016 Rio. Usain Bolt is a once-in-a-lifetime sprinting legend and one of the fastest runners ever. That’s an accurate statement at any point in track & field history. You won’t see this everyday. The finish line of the second 200m semifinal heat captured above features possibly the two fastest sprinters in this event in Usain Bolt from Jamaica and Canadian sprinter Andre De Grasse. “The Lightning Bolt” (29-years-old) has even said the latter (21-years-old) could one day take over the 200m crown, once the world’s fastest man retires, of course. Running and jumping in Junior Olympics and AAU summer track competitions from the third grade through high school, I can say that track & field is an intense sport. An amazingly fun sport, absolutely, but intense. By intense, I mean that every second, split-second, inch and movement is micro-analyzed. All the training and blood, sweat and tears that drip in the summer heat during practice is meant to achieve the maximum results because every second, split-second, inch and movement matters. Whether the stakes are qualifying for the next race, meet or making the medal podium, competing loose (yet with acute concentration) is the name of the game. Keeping this sport’s competitive spirit in mind, that’s what makes the finish of the 200m semifinal heat with Usain Bolt and Andre De Grasse seen above a genuinely special anomaly. The two world-class sprinters were easily 1-2 in their heat to qualify for the final tomorrow night and, surprisingly, chose to showcase their friendly rivalry to the world in an unlikely setting. Thankfully, this moment of playful sportsmanship was captured. Usain Bolt said in an interview with NBC’s Lewis Johnson immediately following the race tonight that he was expecting Andre De Grasse to ease up at the finish line to save energy for the final. Makes perfect sense. However, the Canadian had an alternative plan and instead chose to sprint to the 200m finish line as fast as possible to remind “The Lightning Bolt” that he’ll have a serious challenge tomorrow night. The unthinkable sub-19 second 200m. We all know that a lightning bolt strikes with authority (and apparently a grin). The U.S. Men’s Hockey Team will play against their neighbors from the north in Canada later today (noon, ET) in the semifinals of the 2014 Winter Olympics in Sochi, Russia. The United States has already defeated Russia in the group stage that ended in a thrilling shootout victory. Especially since Finland knocked Russia out cold with a 3-1 win the other day (some may want to place a GPS tracker on those players…), this match-up between the Americans and the Canadians will be elevated to another level. The stakes are high with a spot against Sweden in the championship game, plus bragging rights between these two great nations, as well as between players on various NHL teams, are on the line (technically, the blue line). Canada is traditionally considered the better hockey nation. So, how can the United States rally together to shock the world again this Winter Olympics? I’m glad you asked (different opponent, but still the underdog).